On a pristine Sunday morning, 30 members of the Young Scandinavian Club rubbed the sleep from their eyes and put on their hiking boots. 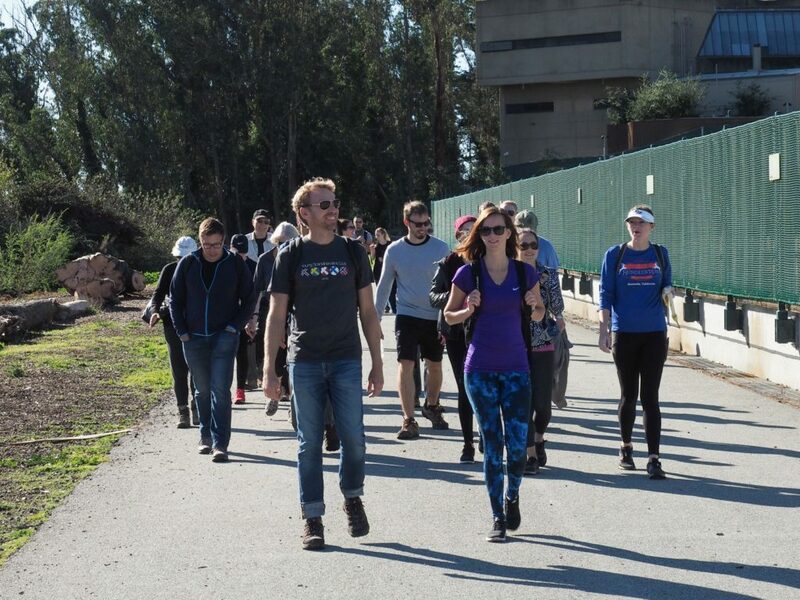 The club was embarking on an urban hike, up and down the hills of our beloved city of San Francisco. Although our club name signifies “Young”, we had hikers from eight different decades, ages 19-82! The rainy weather delayed the event one week, but there was only sunshine and a cooling light wind this December day. Starting at Andrew Vik’s home near the Swedish American Hall, the six-mile hike saw several central San Francisco attractions that give the city its quirky reputation. Hidden gardens and colorful stairways, famous vista points, Seward mini-park and slides, and the city’s narrowest street– hikers sure got their Instagram photos in! Vik, long-time member and organizer of the hike, has lived in San Francisco his whole life. He organized a similar hike almost 20 years ago. Three members from that hike were also present this time around to lead the group, a testament indeed to Vik’s insider knowledge and tour-guiding bravado. Bagels, yogurt, fresh fruit and more were provided to fuel the sleepy hikers at 10am. Breakfast was washed down with some strong coffee (as our Scandinavian culture would command of us) before setting off to Corona Heights Park. Pausing to pet dogs at the park and take photos, the group continued onwards and upwards toward the Mount Olympus pedestal, where the dismantled Triumph of Light statue once stood. 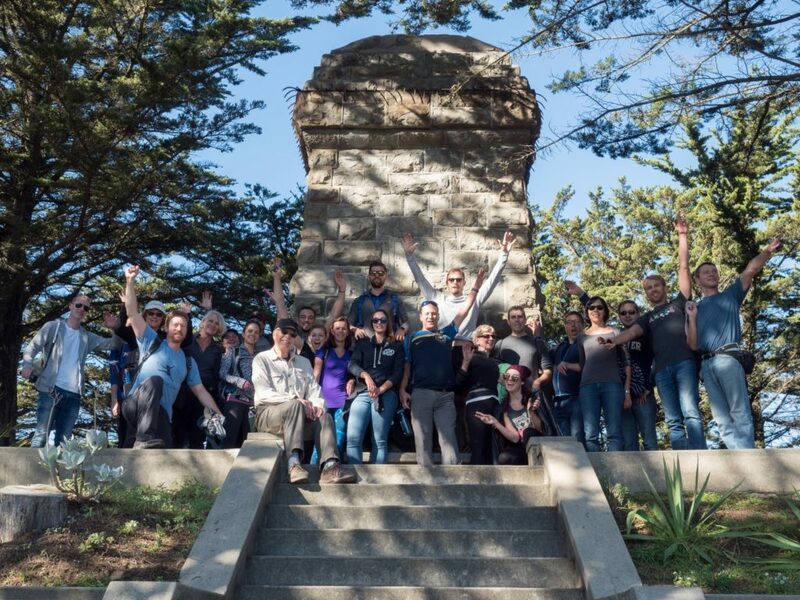 The statue was a gift to the city from the 24th mayor of San Francisco, Adolph Sutro, in 1887. The view from the Upper Terrace stretches out to the Pacific Ocean. Passing through the neighborhoods touching Tank Hill and the Interior Greenbelt off Stanyan Street, we hiked up to the famous Mount Sutro tower. 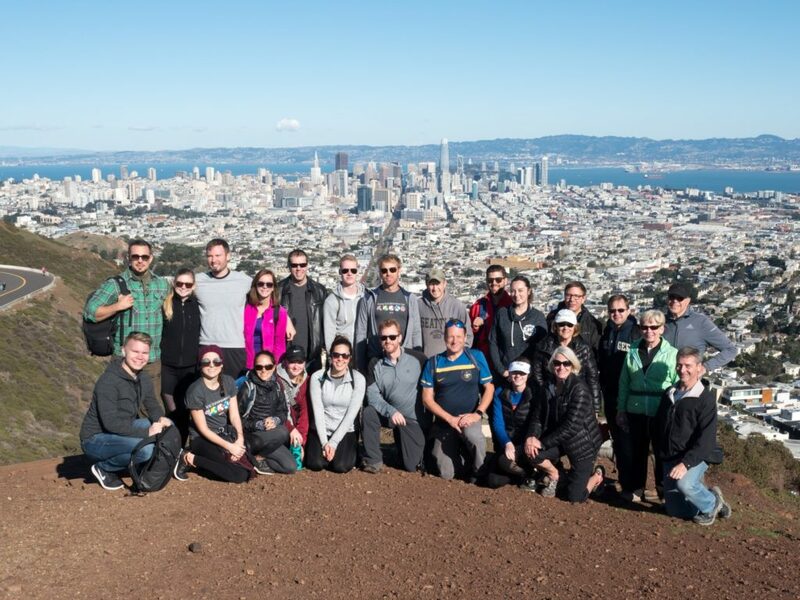 After a small pause for water, the group continued on to the designated lunch spot at one of the humps of Twin Peaks. This mountainous crest is a famous vista point and, evidently for teenagers, one of the best makeout spots in the city. The club was surrounded by tourists and locals alike taking in the cityscape views. The rest of the hike was downhill from this point, if only figuratively and not in spirit. We went next to Seward Park for some fun on a mini playground and double-lane slide. 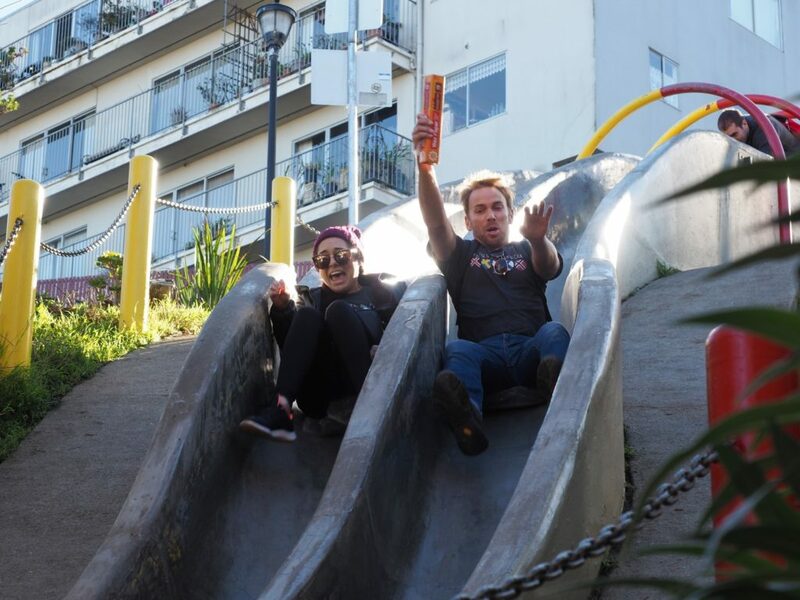 A few rounds up and down the slide gave way to many childlike smiles from our elated hikers. Our second to last pit stop was outside the Alfred E. Clarke Mansion, a storied house that embodies the history of San Francisco. Built in 1891 by an Irish policeman with a colorful yet brutal reputation, the house survived the 1906 earthquake and fires in the Castro neighborhood. It has served as a hospital at one point, and became a city landmark in 1975. The mansion is an amalgam of architectural styles throughout the 20th century, and it remains one of the biggest formerly private houses in California with 45 rooms on five floors. It is now subdivided in 15 rental apartments and actively inhabited today. After all the history and vistas, the hikers descended back to the Castro around 3pm. However, it wouldn’t be a Scandinavian hike without a rewarding beer at the end of it! We congratulated our efforts with a resounding “skål” at The Lookout bar, grateful for our beautiful city and the new relationships we made that day. 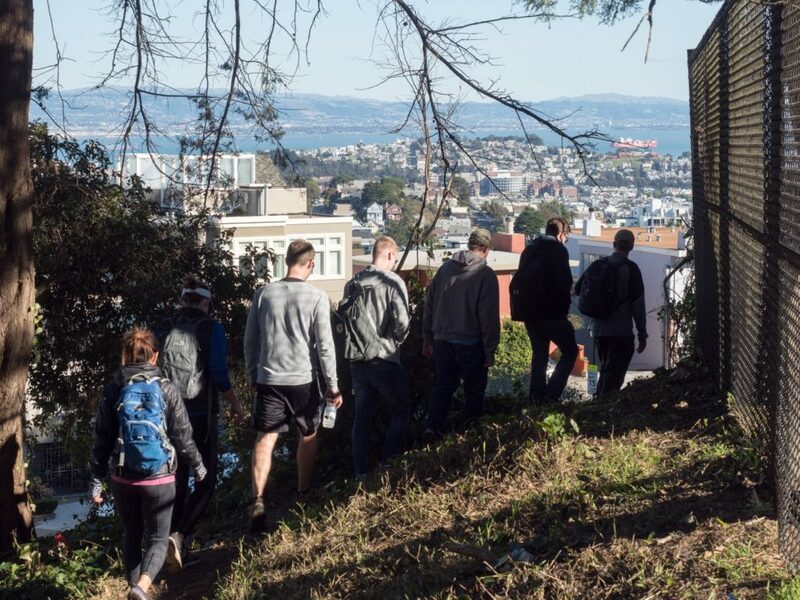 Want to join our hike on March 24th in the North Beach district of San Francisco, including Coit Tower and a snack at the Norwegian Seaman’s Church? Sign up here or purchase tickets from the link on the Facebook event. Tickets will sell out again!